A football stadium is a unique place. A large concrete structure that holds thousands of enthusiastic football fanatic individuals come together to watch 30 players play the common passion which they admire, the game. What constitutes a football stadium? We can possibly break a stadium into structural and physical components. Structural components are the infrastructural elements of the stadium, the structure, the pith, goal posts, seats, dressing rooms, washrooms, flood lights, cameras, sound systems, computers, generators and many more. Physical components include the human elements, which are classified into players, officials, fans, visitors, guests, VVIPS, media persons, stadium staff, security people and technicians amongst many others. A simple stadium which we all look up to as a recreational space is actually constituted of many elements which narrate a story of its own. Whenever we watch a match, we just take note of the 22 players playing the ground, scrutinized by match officials and managed by a team management and being watched by thousands in the stands. But there is so much more to a stadium. Each element in the stadium has its place in the process, its own space in the entire system and power in the system of hierarchy. Every physical component inside the stadium enjoys its own unique sense of power, administers its own chain of power and enjoys its unique position in the hierarchy within the stadium. But what role does the stadium do at large? It exhibits a game, played by professionals in front of a gathered enthusiastic crowed and transmitted via air to million others watching via television, internet or listening via radio. To sum up, it preserves and nurtures a culture. A stadium is a cultivator and preserver of football culture. Let’s us look and deconstruct one such ground which has immense football cultural value. The walled city of Old Delhi beholds many tales. From lanes full of Ghalib’s poetry to taste to mouth watering parathas. From shimmering lights to beautiful attires, you get them all there. But more than anything else, the Forted City beholds numerous cultures. From traces of ancient Mughal culture to a rich Islamic architecture, Old Delhi has it all. But alongside all these, one of the least talked about aspect of Old Delhi is its football culture. Hard to believe for many, but the Old Delhi has numerous football stories to share. Today it becomes a little unimaginable to figure out free spaces in the usually crowded lanes of the forted city. The Ramleela Maidan situated just at the edge of Daryaganj is today is known more prominently because of the political rallies while the historic Ambedkar Stadium, near Delhi Gate, is probably one of the least visited sporting venues of the city. However, about 40 years back, Old Delhi has ample of playing grounds, which slowly perished in the race of modernization and growth. Situated right next to the historic Firoz Shah Kotla Cricket stadium, the 20000 capacity Ambedkar Stadium, which most of us might not have even heard of is undoubtedly the hub of all pure football lovers in the national capital. The stadium itself beholds stories that narrate unadulterated love of few individuals for this most watched game of the world. Ambedkar Stadium is right at the juncture of Old and New Delhi. Right across the gate of the stadium is the Delhi gate that marks the beginning of the fortified city and on the other side we have the starting of the Lutyens' Delhi. For anyone associated with football in Delhi, Ambedkar is the place to be. It has been the host of the world’s second oldest football tournament, the Durand Cup for a long long time, until last year when it was shifted to Goa. Be it the school tournament of Delhi to India’s largest International school tournament, Ambedkar is the venue. Not just this, Ambedkar has also given India its most successful football captain ever, Baichung Bhutia. It was in Subroto Cup here that Baichung was first spotted and from then on, it’s been quite a journey. All in all, the Ambedkar Stadium in Delhi is quite a unique place to be, if you love and follow football in India. Let us today examine this football ground as a heterotopic space. Philosopher Michel Foucault used the term heterotopia describe spaces that have more layers of meaning or relationships to other places than immediately meet the eye. It is described a physical representation or approximation of a utopia, or a parallel space that contains undesirable bodies to make a real utopian space possible. In general, the Ambedkar Stadium is Delhi is like just another concrete structure, but within it it sustains history and culture of a game. Before elaborating, let us first deconstruct the power relation that usually goes unrated within any football ground around the globe. Furthermore, Foucault described several possible types of heterotopia or spaces that exhibit dual meanings; let us use that to understand a football ground. The first one is Crisis heterotopias; there are the privileged and forbidden places where individuals in crisis go away from the society. Now, will any student be allowed to be play in a football ground? As in, let’s take in the example of Old Trafford, the home ground for Manchester United. Will anyone from a Govt. school in India be allowed able to play in it? No right? Only if you have been to the Manchester United School in UK or have played in a privileged football school in any part of the world, it’s only then you become a privileged to play in this privileged ground. The next is the heterotopias of deviation. These are institutions where we place individuals whose behaviour is outside the norm (hospitals, asylums, prisons, rest homes, and cemeteries). Now who can play professional football? Only individuals with extreme fitness level and technical as well as physical abilities have the endurance of being a professional footballer. They deviate from what an average individual is cape able of. Thus those a football ground is an institution where such individuals play. Foucault next describes that a hetrotopia can be a single real place that juxtaposes several spaces. Now football ground is not just a place where you see individuals playing. It’s also a place that serves as an advertising ground for many corporate brands. It’ is also a place of cultural significance. It is also a meeting place of individuals with collective interest. Hence it is a juxtaposition of different other spaces, not just a playground. His next principle, heterotopias of time describes spaces that seem immune from the passage of time such as museums, which contain objects from many eras. They exist in the present but they contain and preserve memories of the past. In that case, a football stadium as mentioned is a preserver of culture. It beholds tales of greatest players and events that the ground has been a witness to. In its dressing room you have the memorials of individuals who came in as no one and walked out as legends of the game. Some like the Old Trafford has museums built inside it, where visitors come in to relive the history. Next Foucault talks about the Heterotopias of ritual or purification. Now these are spaces that are secluded and penetrable yet not freely accessible like a public place. These spaces rely on ceremony and custom and require permission to enter. Now, anyone can visit a stadium, but not anyone can play in a stadium. Also you can walk in as an audience into the stands of the stadium, but you can walk into the pitch of the stadium and get a picture clicked with your favourite star, you are not privileged enough. This is hetrotopia of ritual and purification. Lastly, heterotopias have two functions in relation to all remaining spaces. These are heterotopias of illusion, which expose real spaces for what they are and the heterotopias of compensation, these are real spaces that are ordered and regulated – in a way that is sometimes impossible to achieve in wider society that is often messy and unordered. A documentary on the Football stadium would probably be an example of heterotopia of illusion as it describes what exactly the stadium and its components are. A ground where the home team has always won, irrespective of who is opponent is probably a hetrotopia of compensation, because it is never achievable. Coming back to Ambedkar stadium now, it’s not just a playing ground, it’s preserver of Delhi’s football culture, it’s an epitome of footballing disciple that has produced the likes Indian captain Sunil Chettri. It exhibits heterotopias as it has multiple spaces entangled within one concrete structure. The various components within the stadium also exhibit relationship and power within itself. The common love for football binds the professional players and the spectators along with the managers. In terms of power, the players play for a country, read football federation, or club. The club owners pay the players their salary and hence they own them. The spectators pay money to watch a match thus making revenue for the organizers and the team owners. Then you have the media overlooking everything. 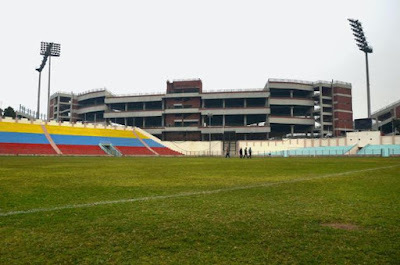 The 20000 capacity Ambedkar Stadium, which most of us might not have even heard of is undoubtedly the hub of all pure football lovers in the national capital. The stadium itself beholds stories that narrate unadulterated love of few individuals for this most watched game of the world. One person, who could have narrated all these tales was Vishwa Nath Singh, who passed away last October. V N Singh has been the voice of Ambedkar Stadium for four decades and in a piece written in 2012 by veteran journalist Vijay Lokapally of The Hindu, he was tagged as the unsung hero of Ambedkar Stadium. Even during the 1995 Durand Cup finals when East Bengal played Tata Football Academy, gates of the Ambedkar Stadium had to be closed with many ticket holders stranded outside. Things have changed now. Ambedkar today is an empty space. Football in Delhi has relocated itself to Jawaharlal Nehru Stadium, Jungpura. Ambedkar today bears an empty look. For anyone, visiting the stadium now, it will be difficult for them to comprehend the space as such as described by Late VN Singh. Ambedkar today represents a heterotopia of time. It exists in time, but also there are other things which no longer exist there. Long back, the stadium used to host the best teams from across the nation; today it hosts schools teams and local football clubs. Once upon a time football enthusiastic crowd used to flock the stadium; today, the stands are empty. Occasionally few daily workers cross the road to sit back and relax in the stadium, not to enjoy the match, but to beat the heat. A Heterotopia of ritual or purification once today is just another place.